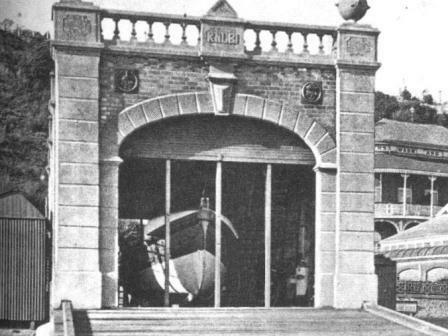 The Royal National Lifeboat Institution Folkestone Lifeboat Station operated from a site near the Victoria Pier between 1893 and 1930. I am very grateful to RNLI for the records of service and details of the lifeboats and the services and rescues which are detailed here. You can also find details of the type and construction of the J McConnel Hussey HERE This was the first lifeboat and the official launch was 25th July 1894. The details of The Leslie, launched 30th March 1903 can be found HERE. Give generously to the lifeboats! The station was established by the Royal National Lifeboat Institution in 1893 and was closed in 1930, when a motor lifeboat was placed at the neighbouring station at Hythe. During it′s 37 years the station had two lifeboats. The first was the ‘J. 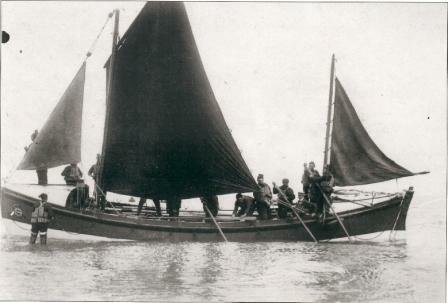 McCONNEL HUSSEY’, a pulling and sailing lifeboat, 38′ × 8′, pulling twelve oars. She was a gift to the Institution from Miss Curling of Denmark Hill, London. She served from 1894 to 1903 being launched on service 4 times and rescuing 10 lives. 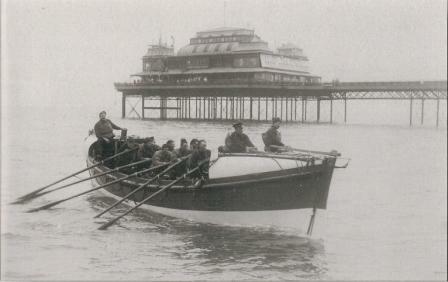 The second lifeboat was also a pulling and sailing, the ‘LESLIE’. She was 35′ × 8′6″, pulling 10 oars and was built out of a legacy from Miss K S Skyknner of Brighton. She served until the station was closed in 1930 being launched on service 21 times and rescuing 16 lives. The record of the station was 25 launches and 26 lives rescued. Folkestone had four coxswains. The first was R J May. No date of his appointment is given but it was presumably when the station was established in 1893. He remained coxswain until 1897, when he had to give up owing to ill health. He was succeeded by Stephen Cook, who served from 1897 until 1919, when he retired, being awarded a pension and a certificate by the Institution. The third coxswain was W H Baker, who served from 1919 until the station was closed in 1930, when he retired, being awarded a pension and certificate by the Institution. 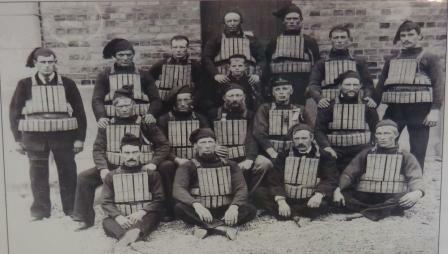 Five Silver Medals have been awarded to Folkestone men for gallantry in saving life from shipwreck. Four of these medals were awarded to coastguards between the years 1831 and 1850. The fifth Silver Medal won by Coxswain Stephen Cook in 1904 for the rescue of the crew of a Folkestone fishing smack, the ‘GOOD INTENT’. See below. 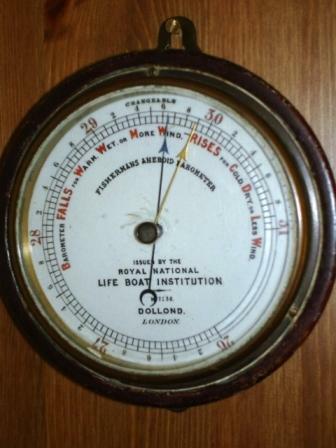 About 10pm signals of distress were seen from a fishing smack being driven before a strong gale from the SW. The assembly signal was made and many willing hands quickly got the lifeboat to the water′s edge; here a desperate struggle to launch took place. Enormous waves struck the boat and time after time washed her broadside on; but in spite of the difficulty of their task the launchers stuck to their post and the lifeboat was at length got clear of the beach. A flare was then seen off Copt Point and the boat made for it. When nearing the smack, which was the ‘GOOD INTENT’ of Folkestone, a heavy sea struck the lifeboat and washed two of the crew out of her; happily the next wave brought the boat close to them and both were picked up. The lifeboat was then anchored and veered alongside the wreck, the three men on board were rescued and the boat started on the return journey. Not withstanding the lateness of the hour large crowds had assembled on the harbour piers awaiting the return of the lifeboat, and at 2.30am a tremendous cheer from the crowd denoted the safe return of the boat and the success of her mission. The crew were loud in their praises of the lifeboat and said she behaved splendidly throughout. Having landed the shipwrecked men the boat was left in the harbour under the care of two watchmen, but her services were fortunately not required again. The smack within a short time of her crew being taken off was dashed on to the rocks and totally wrecked. The Committee of Management as a special mark of their appreciation of the gallantry displayed during this service conferred the Silver Medal of the Institution, with a framed copy of the vote inscribed on vellum, on the Coxswain Superintendent, Mr S Cook, and made an additional monetary grant to each of the crew. Expenses of service – £46.1.0d.